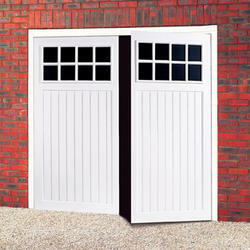 Side-hinged garage doors are perfect for those who require simple access to their garage. Many people who go for the side-hinged option do not keep a vehicle in their garage but instead want regular access to children’s toys, gardening equipment, freezer or laundry facilities. The advantage of this type of door is that the whole door does not need to be opened every time you want to enter. Instead you simply open one section making it easier to use and more functional than a traditional garage door. They are also an excellent choice if you wish to block a section of the garage off or if there are items such as meters in your garage which are close to the door and therefore prevent you from having a traditional up-and-over door. Of course, if you do wish to store a car in your garage then these doors – which open outwards – do not take up any space in the garage leaving you the maximum space available. Side-hinged doors also have the advantage of having very simple moving mechanisms making them easy to maintain. The standard side-hinged door has two equal sized leaves with the right-handed door being the main opening one. Alternatively you can have one small door or one large door depending on the panel structure. Each door comes with two shoot bolt latches for extra security and weather seals on three sides. Lever handles can be fitted inside and out for easy access and for added security there is the option to have an outside knob fitted. The doors come in a range of steel and timber styles. The standard steel doors are white but there is a choice of 17 optional colours. The timber doors come with a choice of stain finishes. For further information and to find out if a side-hinged door is the correct option for you, contact us now on 01992 630 404 or pop into our showroom. Previous: Previous post: Time for a garage door upgrade? Next: Next post: What is a sectional garage door?